Staying protected in today’s connected world is more difficult than ever. With nearly 1 million new malware threats being released every day, you may feel like keeping your private information private is nearly impossible. However, there is no need to despair. HP has been putting security at the forefront of many of their designs and software programs for years. In fact, HP security meets or exceeds NIST Cybersecurity Framework recommendations. This means that you can count on HP devices to help you navigate our connected world with confidence. Many hackers have worked to gain access to the webcams of unsuspecting users. After gaining access, hackers essentially have a front-row view into your life. Using recorded video and audio, some hackers have even blackmailed innocent users. Even if your webcam hasn’t been hacked, you may wish to ensure your privacy when you are not using it. This could help avoid an embarrassing moment if you forget to disable your camera during a video call or conference meeting. One of the most simple but effective and practical HP security features is the HP Privacy Camera. This is a physical webcam cover built into some models of HP laptops. By offering a physical way to disable the webcam from capturing video, HP gives users complete control over whether or not they want to broadcast video. The HP privacy camera renders malware targeting webcams essentially useless. Have you ever been working on your laptop at a coffee shop or on an airplane and felt as though someone was watching your every move? Not only is this annoying and uncomfortable, it could be very alarming if you are viewing sensitive information. HP has implemented the HP SureView privacy screen into some laptop models. The HP SureView works much like a privacy screen protector by making off-angle viewing nearly impossible for people with wandering eyes. Only the user can clearly see what is on the display. However, unlike a physical privacy screen, HP SureView is a software feature that can easily be enabled, disabled, and adjusted. This gives you complete control over the privacy of your laptop. What happens when the programs meant to protect your device are turned against you? This is the goal of many types of malware that actually target anti-malware applications on your computer. By targeting the protections you have in place, malware can ensure you are unable to remove it. HP SureRun ensures that when you boot up your device, it is protected. This hardware-enforced security measure stops hackers from destroying the protections you trust to secure your data and your privacy. HP SureRun protects critical processes and prevents malware from making changes which would allow it to take over your system. Best of all, HP SureRun can be configured for applications of all sizes. Small businesses can use HP SureRun on individual devices while larger businesses can use this security feature at an enterprise level. A strong password is one of the most effective ways to ensure your device is secure. 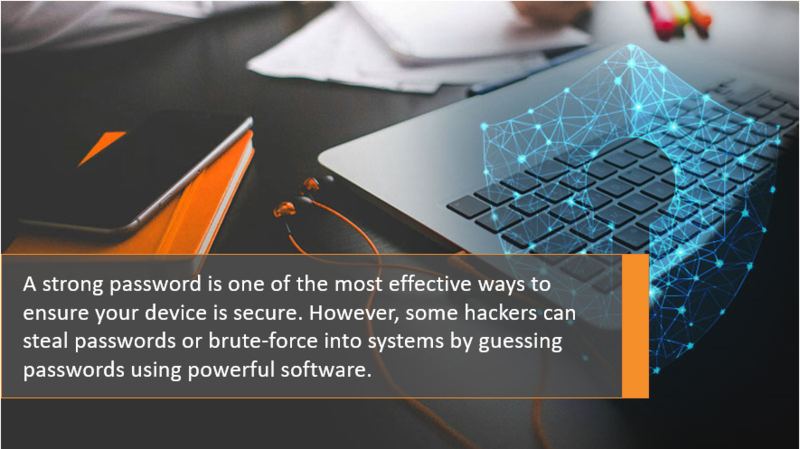 However, some hackers can steal passwords or brute-force into systems by guessing passwords using powerful software. How does HP security address this concern? HP multifactor authentication adds an additional layer of security to stop hackers in their tracks. With HP multifactor authentication, simply having a password is not enough to gain access to critical data or infrastructure. This security measure uses an additional form of authentication on top of a password requirement. For example, this could include fingerprint verification. By adding the second layer of verification, security is tightened and the risk due to lost passwords or dedicated hackers is minimized. Enabling HP multifactor authentication is one of the most effective HP security features that users can easily implement into their day-to-day device usage. HP is a leader in digital security. Whether you are an individual user or a large organization seeking to protect your critical data, HP security will exceed your needs and expectations.